Just Jingle: Picture with Santa, anyone? Did you see the Paper Smooches SPARK! challenge this week? It's all about cameras and polaroids! Totally fun! But...because I have to got and be THAT KID... I went a little different direction with my card. LOL! So...Are YOU ready for your picture with Santa? HAHAHAHA! This walrus CRACKS.ME.UP. Totally. And completely. And totally. Just sayin'. And, OBVIOUSLY, he's excited for this amazing holiday photo op! 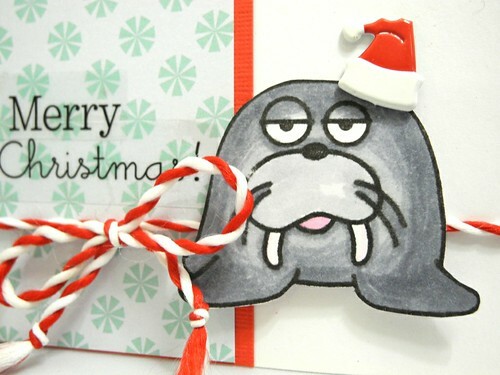 Some people send 'real' photo cards for Christmas, personally, I think this Walrus photo card is more me! HAHAHAHAHA! His expression SLAYS me, I tell ya! 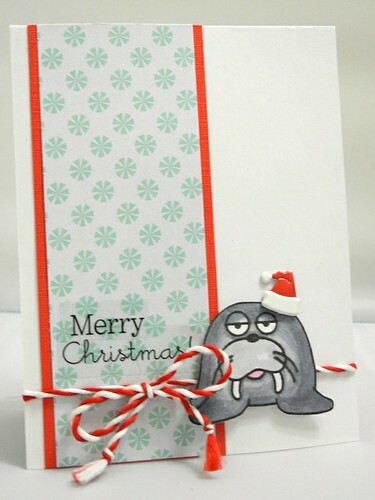 The adorable walrus is from the Chilly Chums Paper Smooches set and that FREAKING ADORABLE Santa hat is from the Eyelet Outlet! LOVE.IT!!! The super fun twisted twine is from May Arts, of course! You can find the fun goodies I used on this card in the linky below! Have a super fabulous and amazingly awesome Thursday, peeps! soooo cute!! i am working on my sparks challenge today! That is TOO CUTE! I love him. hehe you are too funny...love how fun you are... this card is too cute..love his hat and that string is awesome..
this is so cute! love that string! gotta love his expression...awesome card! HoHoHo, he cracks me up!!!! Awww! What a sweet card! What a fun take on the challenge! Love the color scheme. Thanks for joining us for the Paper Smooches SPARKS Challenge!